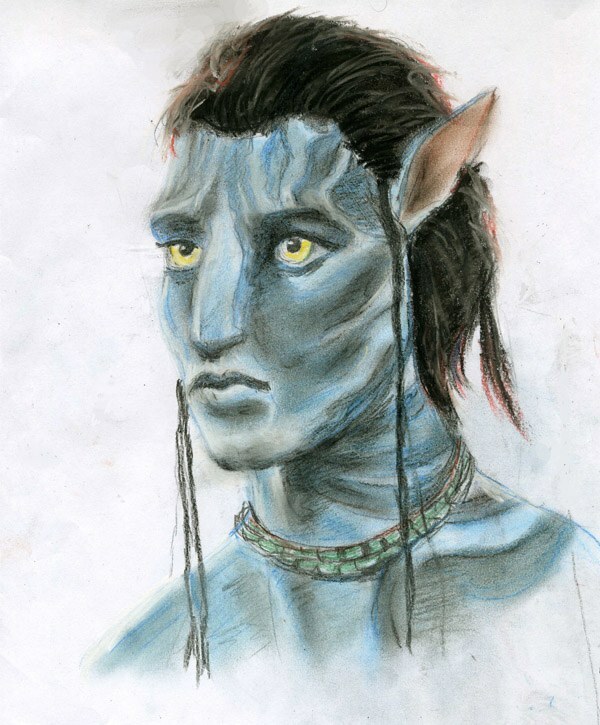 Try to draw the main character of the film "Avatar". 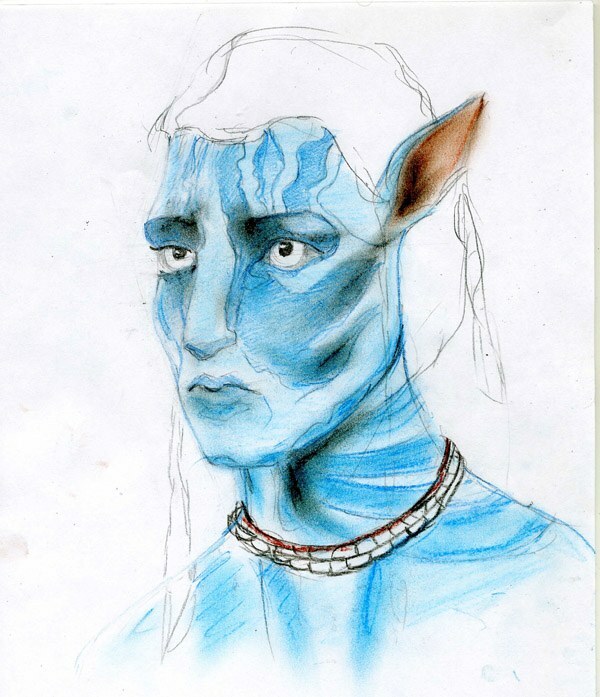 One of the peculiarities of his appearance – blue skin. So figure it is better to use colored pencils. As a basis we can take a picture from the Internet or make a screenshot of the movie. - a sheet of paper. First, make a sketch a simple pencil. 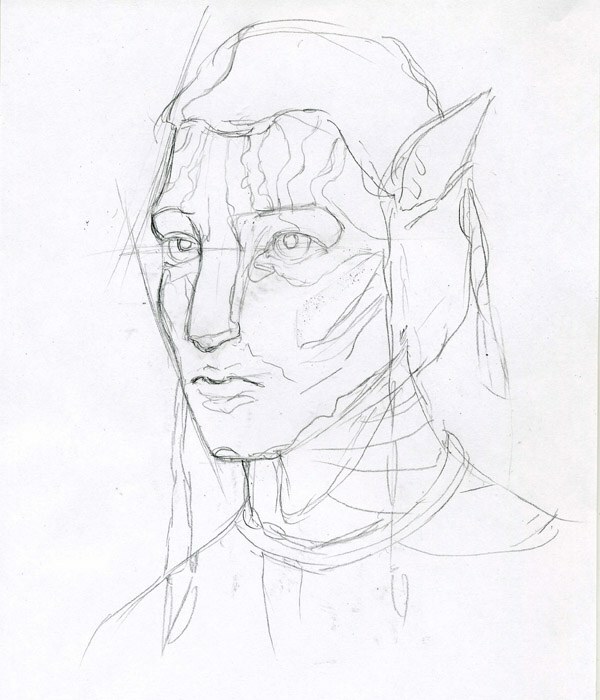 Face Avatar combines features of humans and cats – try to pass that on. See how planes can limit the contours of the face, and construct auxiliary lines. Eye level is also label line. Measure the size of the face parts relative to each other. Draw the contours of the face. 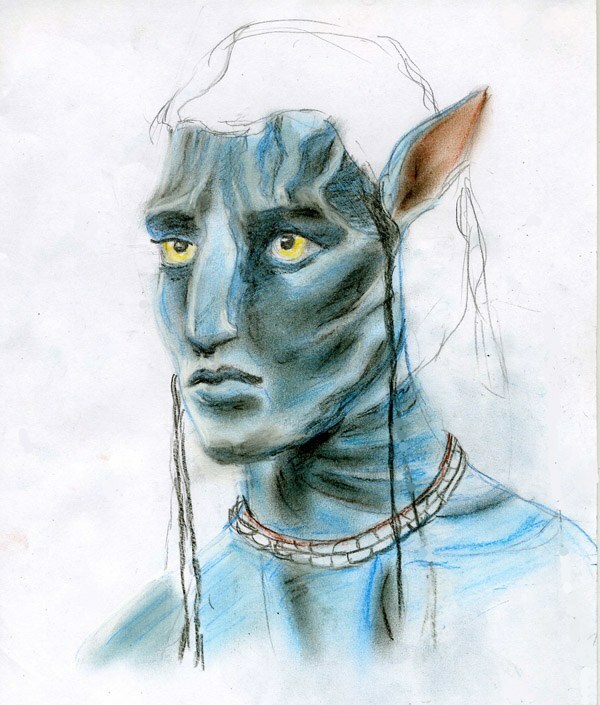 Please note – the bridge of the nose from an Avatar wider than the base of the nose, and the pupil covers almost the entire eye. Draw the bounds of basic chiaroscuro. 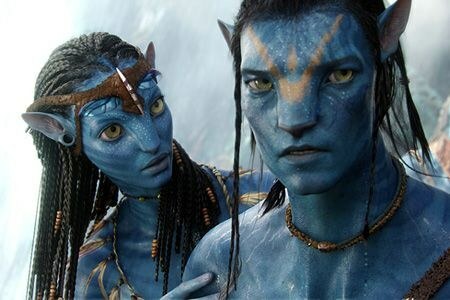 Blue skin of the Avatar is covered with gray-blue stains. Draw their outlines. Now take a blue pencil and circle features. Line simple pencil and wash in the process. 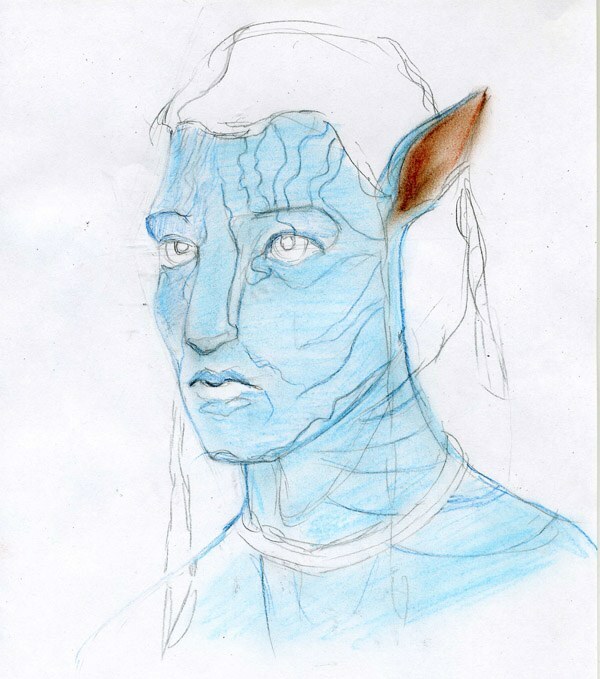 Stroke the whole face of the main blue tone, and the inner part of the ears brown. Pound touches a piece of paper. 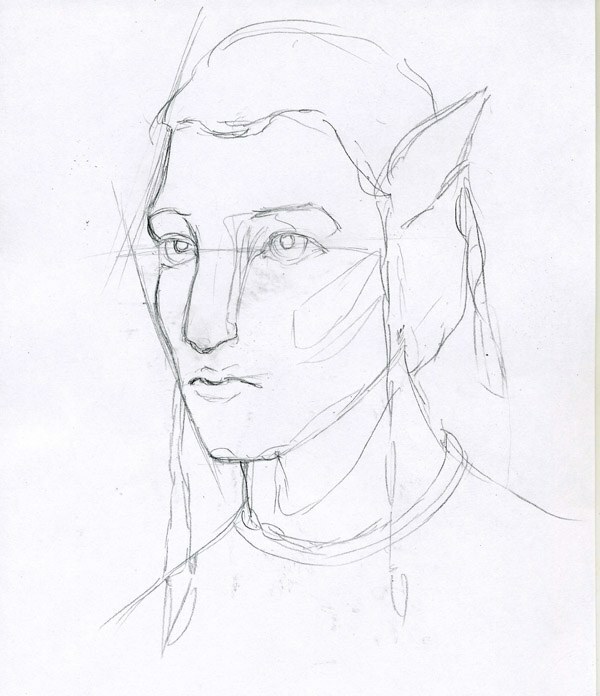 Over the basic brown tones shade the dark areas of the ear. Make the blue color bands on the face more intensively. Over blue pencil apply the black shade with a pencil. Hard on the pencil to press, the finishing touches should be translucent. Dark areas indicate dense, overlapping strokes. Mark black pupils, not forgetting to leave the highlights white. Make the whites of the eyes is darker than the iris – so will create the effect of glowing eyes. Draw the hair with black pencil. Make long strokes in the direction of hair growth. Do not try to keep a strict parallelism – the hair needs to lay of the strands. Vysvetlit eraser a few strands. A red pencil mark hairs, gleaming in the sun.